Music superstar Aaliyah’s life was cut tragically short in 2001 as the singer was attempting to return home from the Bahamas after a video shoot. Like Buddy Holly decades earlier, Aaliyah Haughton perished in a plane crash at age 22. She left behind a discography full of R&B hits, plus she was just getting started as an actress. Certainly her life and career contains stories worth telling, but the Lifetime movie Aaliyah: The Princess of R&B doesn’t effectively accomplish that. Let’s face it, The Buddy Holly Story wasn’t a great movie (“artistic liberties” doesn’t begin to describe what a hatchet job it is), but it was at least anchored by an outstanding, Oscar-nominated performance by Gary Busey. Aaliyah and her fans deserve better than The Princess of R&B. 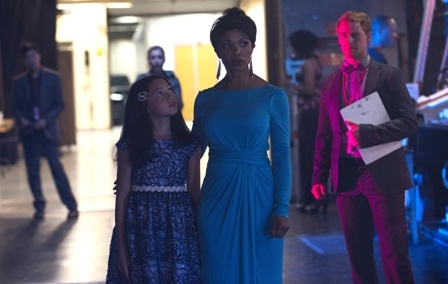 The Wendy Williams-produced biopic, which earned high ratings when it aired November, 2014, is now available on DVD. Director Bradley Walsh and screenwriter Michael Elliot sketch out a basic outline of Aaliyah’s (Alexandra Shipp) life. We see her as a child on Star Search, appearing in concert at a very young age with her aunt-through-marriage Gladys Knight (a very good Elise Neal), and being “discovered” by R. Kelly (Cle Bennett). Throughout the film, the dialogue continuously rings false – as if someone always meant to rewrite it, but never got around to it before shooting started. As a result of the stilted, sub-soap opera writing, the cast never finds any kind of groove. It’s bad enough that Shipp doesn’t look much like Aaliyah, nor does Bennett look like R. Kelly, and so on (Chattrisse Dolabaille was poorly cast as Missy Elliott, as was Izaak Smith as Timbaland; both have admittedly tiny roles), but they aren’t given characters to play. It’s as if we’re watching a generic romance; these characters could be anybody. We don’t any sense of what made Aaliyah a distinctive, individual artist. Luckily there’s a decent documentary on the DVD, Beyond the Headlines: Aaliyah, that does convey a fair amount of good info about the late singer. This show aired on Lifetime as well, immediately following the movie. It’s a standard-issue Behind the Music-type program, but at least we get to see and hear the real Aaliyah. 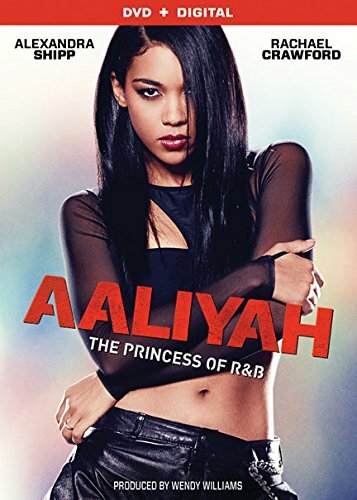 Keep in mind, Shipp sings the songs in Aaliyah: The Princess of R&B because the producers couldn’t secure the rights to the original recordings. While she’s a capable vocalist, her singing is bland and only adds to the overall generic feeling conveyed throughout the movie. Shipp seems to also be a capable actress (can’t wait to see her as the young Storm in the upcoming X-Men: Apocalypse; she’ll also be featured in F. Gary Gray’s upcoming NWA biopic Straight Outta Compton this summer). The blame doesn’t fall anywhere near her for The Princess of R&B being so flat.